Der Schaumreiter scheitert in einem Raum voll Scheiter. Vapeurs en fleurs vous lêtes tourbillons de gaz amoreux. These are two extracts from the poems of the Estonian-born multi-talent Ilmar Laaban who was primarily known for his surrealist and intense poetry. As an artist with the gift of music, he was also keen to explore the melodic side of his weird works in the form of so-called ‘häälutused’ (soundations). In 1998, a few years before his passing, Swedish label avant-garde label Fylkingen Records collected the works of Laaban who had found refuge in Sweden during the WWII and belonged to the country’s wild verse innovators through decades. Laaban also appeared in a number of experimental, non-music compilations, most notably in the Sveriges Radio’s “Text-Sound Compositions”, which was a series of rare recordings made during thematic festivals in Stockholm and in 2006 compiled by Fylkingen as a five-CD box. 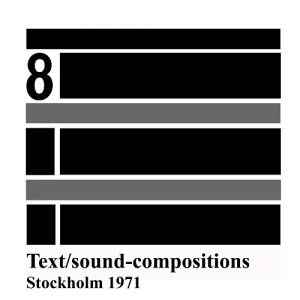 High-grade experimentalism of “Text-Sound Compositions” stopped with the 1970 edition and now, over 40 years later, Fylkingen has retrieved archive material to resume the series, covering the years 1971-74. The label is now taking pre-orders for four previously unreleased LPs expected in October. No sound previews have been made available but below are some examples documenting the style of two artists having performed in “Text-Sound Compositions”. PS: The following seems very far-fetched but Laaban, who was inspired by Marcel Duchamp’s alter ego Rrose Sélavy, has performed a poem titled “Eaux”. Another Duchamp admirer, techno artist Rrose gave the same name to his label. Could be pure coincidence and it doesn’t mean that Rrose has been aware of Laaban’s works.